Hey guys. Just joined up here. I recently got my 65 Edinboro for free! Its a little beat up, needs paint, and some other stuff, but im hoping to turn it around into a good looking nice boat. Im pretty sure the windshield that is on it is not the correct one. Anybody know what style windshield this should have? So far i have replaced the steering cable that was completely seized and started buffing the paint a little bit. Welcome aboard, always great to have someone new interested in keep the old girls afloat. Nice find and sure can't beat the price. This is the place for excellent advice on how to proceed. Everyone is interested in someone starting a new project and will give you years of experience of what to do and sometimes not what to do, what works and especially what doesn't work. Just ask. I would suggest you start a new thread in "member projects" and above all post lotsa pictures. We all like pictures. Did you check out the classic library? Click on the link at the top of the page and just scroll down to you make, model, year, etc. Congratulations on your new boat. Welcome aboard! I own a 1962 MFG Edinboro and grew up with my dad's 1965 Edinboro, so I am well familiar with these boats. With the style deck and motor well you have, your boat is definitely at least a 1965. 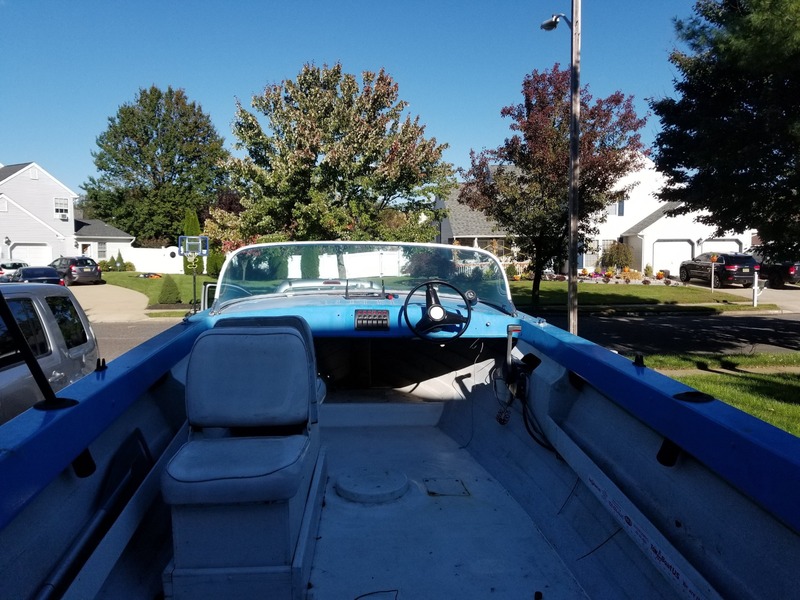 The style windshield you have was used on Edinboro models up to 1964, but for 1965 and later, it came with an aluminum frame skiff-type windshield with safety glass rather than plexiglas. Yours looks like it is not fitting real well, probably the wrong size, but I'm sure that led you to believe is not the right one, and you are right. 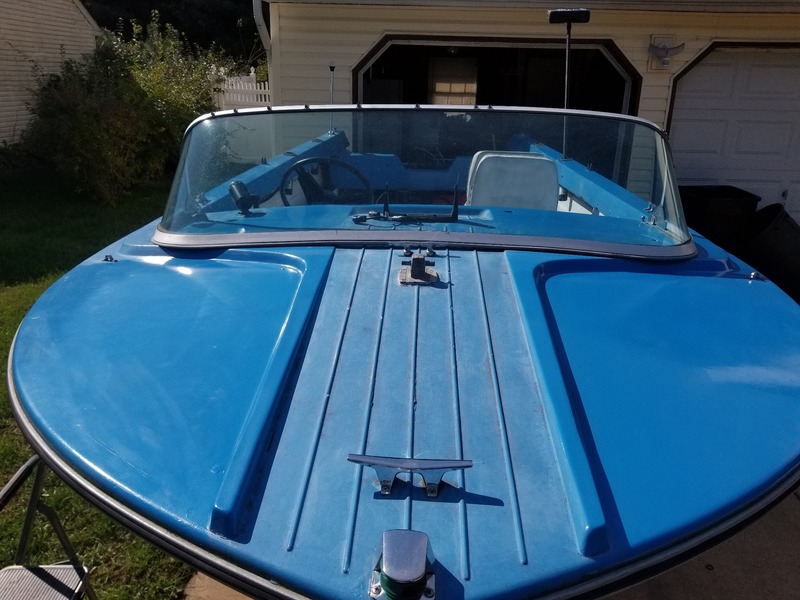 The plexiglas windshields are still available on special order from TaylorMade, but last I checked, the OEM skiff-type windshield is no longer available, so you would have to find a donor boat. Look it over - there is lots of good information. The suggestion to move the discussion to the "Member Projects" is a good one, but if you post here, that's OK too. I check the MFG topic regularly, and having direct experience with this model and other MFGs, I can be of help. I've included a picture of my 1962 Edinboro. Thanks for the warm welcome! guys! And also thanks for the info. I did realize that the windshield is wrong while researching the boat. My title says its a 65, just didnt add up to me about the windshield. I did see that my style windshield was used up till 64. And your right it does not fit, it is not wide enough. The floor more towards the sides is a little bit soft, so i will probably have to do a floor in it soon. The transom is solid, no flex in it what so ever. The motor is a 40hp 2 stroke suzuki from 1995. Starts up and runs perfect, just put a water pump and changed the lower gear oil. I will definetly make a post in the member projects section. Just finished working on the trailer, that needed more work than the boat itself i think. Check the floor carefully. Those boats have a fiberglass floor with fiberglass stringers as they came from the factory. Is your floor fiberglass, an off-white with a pebble-type finish? There is not wood under the floor to rot, but there is foam. If the boat has had water get under the floor, it can get saturated. This impairs flotation and adds a lot of weight. At the transom bottom, there are two plug holes. The one on the starboard (right) as you face the stern from outside the boat is a hole/plug for draining any water that may get under the floor. Raise the bow of the boat while on the trailer, remove the starboard plug, and see if any water dribbles out. You can also use a moisture meter to check. Also, check the transom carefully. These transoms almost always need to be repaired. See the article on the hidden side in the "How to" section. I used a newer material, Carbon-Core CarbonBond, to do a poured transom on my 1962 Edinboro. Also carefully examine the bottom of the boat, especially along the keel, for damage. Mine had three holes in the keel from roller damage and a fourth hole on the bottom port side that looked to be from a rock. davnau6345 wrote: Check the floor carefully. Those boats have a fiberglass floor with fiberglass stringers as they came from the factory. Is your floor fiberglass, an off-white with a pebble-type finish? There is not wood under the floor to rot, but there is foam. If the boat has had water get under the floor, it can get saturated. This impairs flotation and adds a lot of weight. The whole boat has been painted before so its hard to tell from just that. I got the boat off of a buddies dad who had used it for about 6 years then it sat for about a year and a half due to lack of time for it. Its definitely a fiberglass floor. I have raised the bow to tilt the back end out to make sure no water was in there, there was none. and i do not hear any water splashing around under the floor either. I have inspected the boat top to bottom inside out. When it was sitting it was also sitting with the bow raised so hopefully any water that may have gotten in there would have ran right out. My buddies dad said it never leaked water once and he never had any issues with the boat itself other than some running problems with the motor that have been since sorted out. Ill have to talk to him to see if the transom has been repaired either by him or previous owner, but its definitely solid.